Do we care about the future generation? 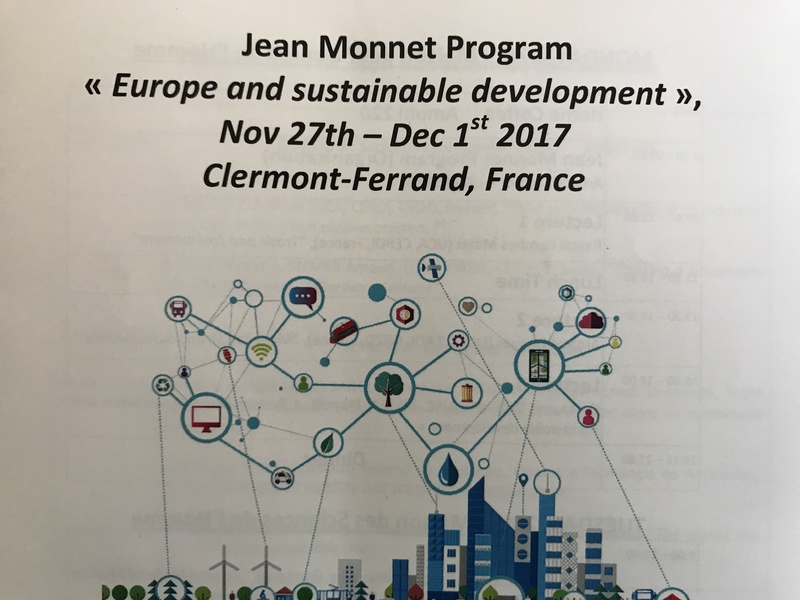 With pleasure I participated at University of CLERMONT FERRANT Jean Monet Program ?Europe and sustainable development which took place on November 27th- Dec 1st 2017 in Clermont Ferrand. Also the International Symposium ?Michelin Network of sustainable cities? which took place on 29 and 30 November 2017 where mayors of 40 cities from all over the world came together. I was joining both programs to share my political view of European Parliament and EPP to this subject. What should lead us to sustainable city? What should lead us to sustainable EU? Three years ago I wrote down in my book START UP EUROPE: ?Sustainable economic growth, where we use fewer resources and produce more products is more realistically achievable in times of crisis, rather than in time of plenty. History has taught us that times of plenty in themselves limit creativity. The most important areas that will require major changes are mobility, food, health and housing. This is also opportunity to do more with less.? This content was still very actual in this two event in Clermont Ferrand with particular importance on mobility and sustainability by using world resources. Conference with international students and experts was oriented to sustainability in cities. There are no answer about growing population in the cities, some predictions says that in 2040 will living 70% all the population in the cities. My proposal was related to necessity of further researching how to motivate people and setting conditions that they will stay also in rural area. Being connected to the land and nature also gives us inner happiness. Only when we become aware of how many people live with chronic disease then we will put more attention also to sustainability and our personal footprint which we are making with our lifestyle. Why Brexit was happened and how could be EU protected against similar idea? Why EU has been acting slow by migration crisis? What is procedure by new legislation especialy by codesission making from the side of EP? On the Conference organized by International Network of Michelin Cities I made the presentation regarding mobility. ?As a former health minister and as a member of ENVI Commitie in EP I?m acting more for health of people and health of our planet. European Parliament was carrying out almost all necessarily legislation as a base for mobility which is also one of the key for sustainable city. Digital Europe, internal digital market and Big Data are the new technical opportunity to connect people by mobility needs. For example Uber using this data today faster then legislation could follow. In some member states we need to improve public transport . We need to think about new workplaces as a positive consequences to small and medium enterprises. We should be thinking not only about people needs but also about peoples feelings. All of us would like to feel safety and still have privacy. Mobility could improve safety of people especially by accident, natural catastrophe or urgency of health. Mobility and accessibility are very important for sustainability and for business development. We need a safe European Union with peace and without arguing. We don?t like to have after Brexit another Brexit. World known photographer Yann Arthus Bertrand was presenting the world nature and people with his photography and films. His new film WOMEN showed the all misery of women in poverty which are calling for political action. Cecile Coulon as a young and very successful writer was presenting her last awarded book ?Trois saisons d?orage.? Her childhood was being in a village and today she writing and motivating young people that they should live more connected to nature. Since I?m acting in FMA CAMPUS program, I have to emphasize that the organization from the University Clermont and Prof. Mr. Arnaud Diemer was excellent. That was visible also how the students were motivated and how they participate in our discussion. I would like to thank you both.